Hacking can have a serious impact on any business, regardless of size. Consider the recent experience of Equifax, who is still scrambling to find an answer for their mistakes in the aftermath of the infamous breach that compromised sensitive data for more than 143 million customers. The fact is there may not be a future for Equifax, if popular sentiment is to be believed. Experts predict the final scenario could be between saving the company by implementing increased cybersecurity measures and paying out a large amount in settlements, or a merger/closure/rebranding into a new corporate identity. Either option is going to be costly, and the company may not survive it. Here’s how an Equifax like hack can impact your business. You might believe your small to medium-sized enterprise doesn’t offer enough to entice big-time hackers. You are mistaken. With 43% of hacks targeting small businesses at an average cost of $117,000, even small, family-owned companies are at risk of being driven out of business by a single hack. Statistics from the Identity Theft Resource Center (ITRC) shows 1,103 total breaches so far in 2017, compared with 1,091 in total for 2016. While the upward trend doesn’t seem like a huge increase, the final total for 2017 is expected to be significantly higher by year-end. Today’s consumers are ultra-aware of the need for cybersecurity, and when they provide you with their personally identifiable information (PII) it’s an indication that they trust you. A breach states loud and clear that you didn’t think highly enough of them to ensure data security, which translates into being untrustworthy not only in the eyes of consumers but also current and potential stakeholders. 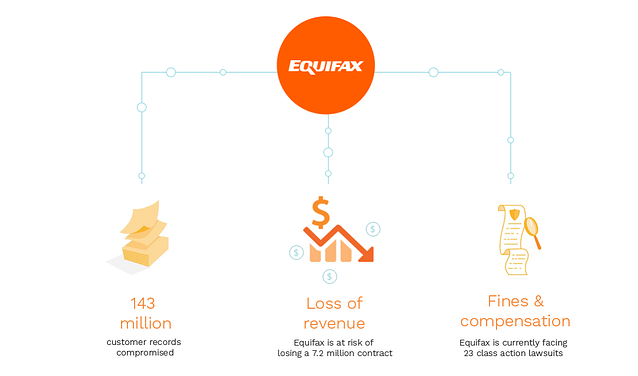 Due to this, you can expect your revenue stream to decline over time beacause of a poor customer retention rate paired with the inability to acquire new business, just as Equifax is at risk of losing a $7.2m contract with the IRS. Overall, calculating the loss of business from a marred reputation is almost impossible, even with long-term projections on which to base it. In addition to the loss of revenue, your company could be hit with multiple fines and lawsuits. In the case of Equifax it faces 23 class action lawsuits, which could result in the payment of damages and compensation to any number of former and current clients. Many complainants have been driven to take part in the lawsuits because they are owners and managers of small businesses, and as such their ability to access working credit and funding is closely connected to their personal credit score. Participants also want to be protected against future damages as well as being reimbursed for the time and cost they spent looking for repercussions. In the event of a data breach, the fines and compensation payable could result in bankruptcy for the organization. Credit bureaus have typically been considered the megaliths of information security, but the Equifax breach changed all that. If a company of Equifax’s size and nature could get hacked, how much more vulnerable is a small business with 7,000 data records? On any given day you can find credit card numbers being sold for minimal sums on the dark web, most of which were harvested during lucrative hacks on small businesses. For Equifax, all it took was not updating their servers with the newest software patch available. The key in avoiding a similar situation and safeguarding your company from a potential hack is to proactively manage and continuously monitor your technology infrastructure while making sure you have the correct cybersecurity measures in place.